For more than 25 years, the University of Wisconsin-Parkside’s two duplicates of the famed “Sifting and Winnowing” plaques that memorialize the Richard Ely academic freedom trial sat in a corner of the archives, virtually untouched. On at least two occasions, efforts were made to put the plaques on display, but to no avail. Then in 1998, with the university’s 30th anniversary looming, Interim Chancellor Dr. Gordon H. Lamb decided the time had come to give the plaques their proper due. Old trophies line the shelves inside the former Madison Brass Works on the East Side of Wisconsin’s capital city. Just feet from where craftsmen over the years made everything from airplane parts to torpedo components sit icons of more leisurely pursuits: a bowling champion from 1949, boat-racing trophies from the former owner. They sit seemingly untouched since the day they were placed there nearly 50 years ago. Much about the wood-frame foundry seems in a time warp. Old foundry patterns hang along the side walls like suits in a closet. The floor is stacked with flasks and jackets for pouring and forming molten metal. A huge green muller sits in the center, used to mix sand and carbonite. It all looks straight from the 1940s. It’s a good thing this place lives in the past. 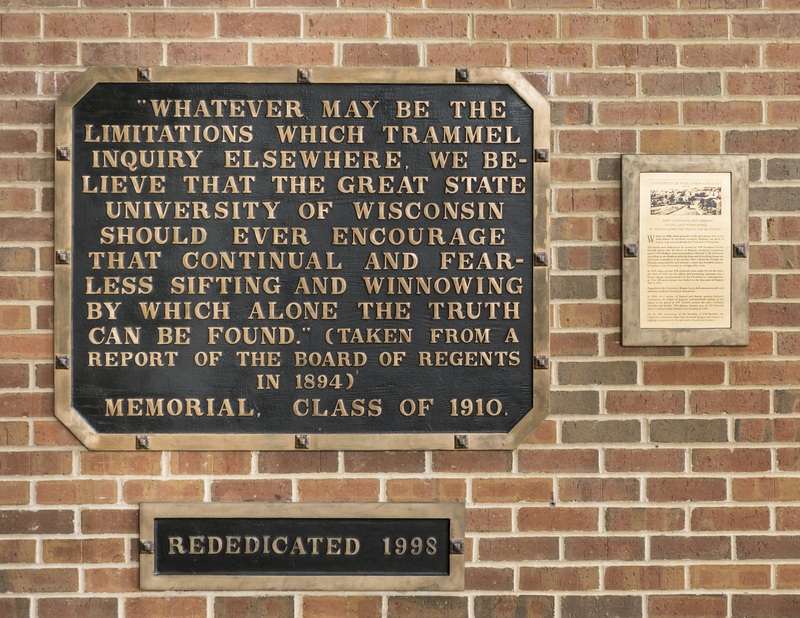 This building where the University of Wisconsin’s “Sifting and Winnowing” plaque was made in 1910 came to play a big role in UW-Parkside’s project to restore and display its versions of the 255-pound plaque in 1998. The Madison Brass Works technically no longer exists. 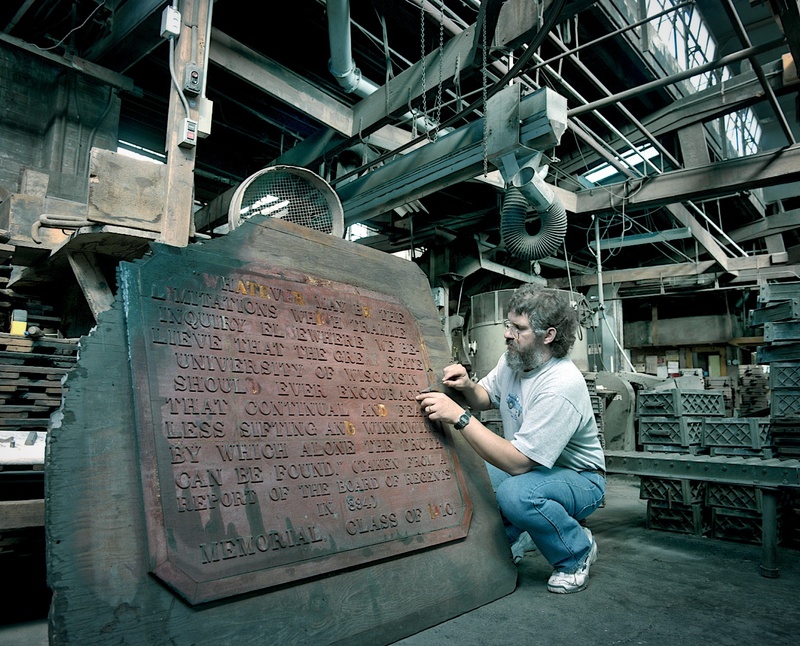 Now called Celestial Stone Foundry and Forge, the company and its one employee/owner helped repair and restore UW-Parkside’s two sifting and winnowing plaques and cast a rededication plaque using the very same pattern-maker’s letters from the original. In 1910 when UW-Madison student Hugo H. Hering made what he later called the “purely hand-made” wooden pattern for the sifting and winnowing plaque, he couldn’t have intended for it to survive much beyond creation of the one plaque. 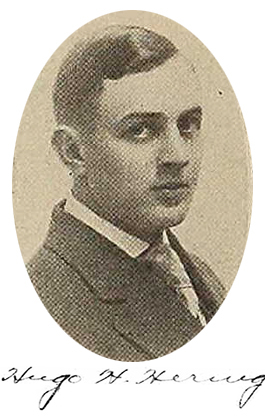 Student Hugo H. Hering chaired the memorial committee. His effort not only survived his time, but it may still exist today. 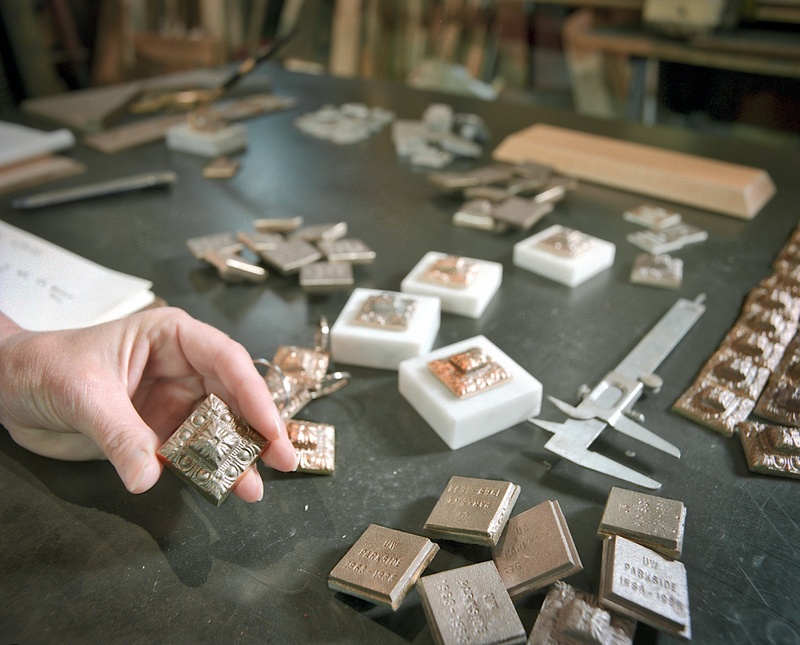 When contacted in early 1998 about making rededication plaques, Tom Pankratz, the owner of Celestial Stone Foundry, located the old wood pattern buried under others at the foundry. He can’t be sure it is the exact version from 1910, but it is a distinct possibility it is original material from the Class of 1910. Dave Olson, a retired Madison Brass foundry worker who volunteered his time to work on the UW-Parkside project, said it was unusual for patterns to survive so many years. “Most places would either return it to the owner or get rid of it,” he said. Pankratz carefully lifted letters from the historic pattern to create a plaque for UW-Parkside that states: “Rededicated 1998.” It has the look and feel of the first sifting and winnowing plaque with the added historic flavor from the original letters. Pankratz also found a master copy of the bronze anchor covers that adorn the original plaque on Bascom Hall in Madison. The ornate, 1.25-inch square tablets were used to cover the holes where the anchors were inserted to hold the plaque in place. Using the master, Pankratz created matching anchor covers for UW-Parkside’s plaques. “Originally it was probably made by a hand carver,” Olson said. Artists Martha Glowacki and Mary Dickey of Sylva Designs of Sauk City worked with Pankratz to repair and restore the two 4-by-4-foot plaques. The UW-Parkside plaques were cast in 1964. The holes drilled in the plaques when they hung at the old UW Centers in Racine and Kenosha were welded and new holes drilled to match the original plaque. The black surface under the brass letters was repaired and repainted. The brass surfaces were machine- and hand sanded and polished. At completion, the restored plaques had a luster probably matched only by the original sheen. Glowacki also created plaques that include explanatory text briefly telling the sifting and winnowing story. Those exquisite bronze plaques have etched letters and an etched photo of the UW-Parkside campus. “We enjoyed the project,” Glowacki said. She, Dickey and Pankratz, all UW-Madison graduates, said it was a privilege to work on a project of such historic importance to the university. In the case of the Sifting and Winnowing plaques, the third time was a charm. A committee of the 20th anniversary first attempted to find a suitable location for the plaques, but that effort was never completed. In 1992, UW-Parkside Interim Chancellor John Stockwell expressed desire to install the plaques, but the project didn’t happen before he left the university. Dr. Gordon H. Lamb made the decision to restore and display the plaques. In 1998, Interim Chancellor Gordon H. Lamb saw an opportunity to install the plaques, tie them in to the 30th anniversary and promote a longstanding tradition of academic freedom. “The plaques symbolize such tradition,” said Lamb, who went on to lead the University of Missouri System after leaving UW-Parkside. “I felt it was important the campus embrace the history and the tradition.” Lamb headed a committee that oversaw the restoration and planned for the new displays at UW-Parkside. The group included UW-Parkside Archivist Ellen Pedraza, who called new attention to the long-stored plaques in 1993. At the rededication event held at UW-Parkside in late November 1998, new Chancellor Jack Keating expressed gratitude for the work to “free the plaques from the archive.” He said the plaques are an important reminder of free intellectual discourse. Professor Emeritus of Economics W. Lee Hansen said the plaques are a “vivid expression” of the university’s search for truth. The plaques were installed just outside the UW-Parkside library near the portrait of founding Chancellor Irvin G. Wyllie, and outside of the Admissions Office in Molinaro Hall. Dave Olson preps the form with carbonite. Olson and Pankratz lower the form into place. Pankratz and Olson prepare the form for the molten metal. Pankratz moves the bucket of molten metal with the aid of a hoist. The load is steadied before the pour. 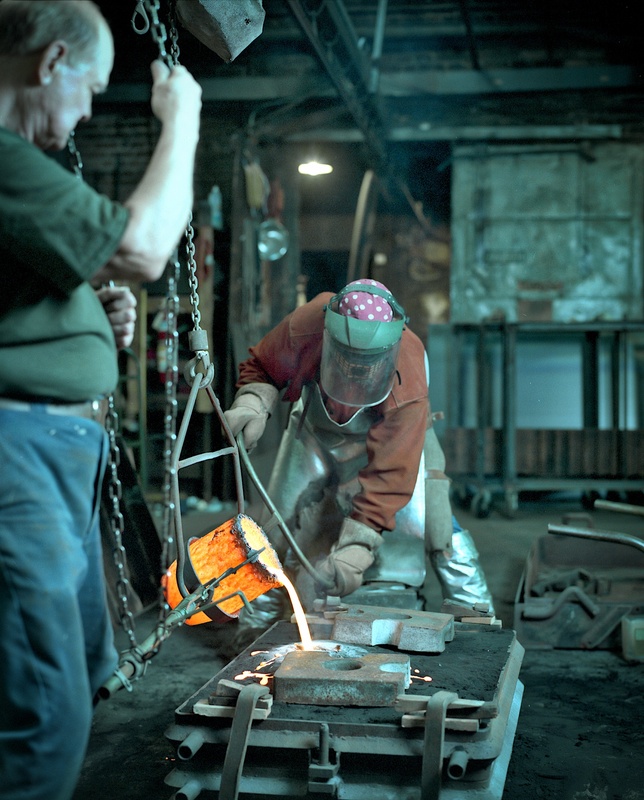 Pankratz pours molten metal into the form while Dave Olson watches. The anchor covers were used as give-aways at the rededication. 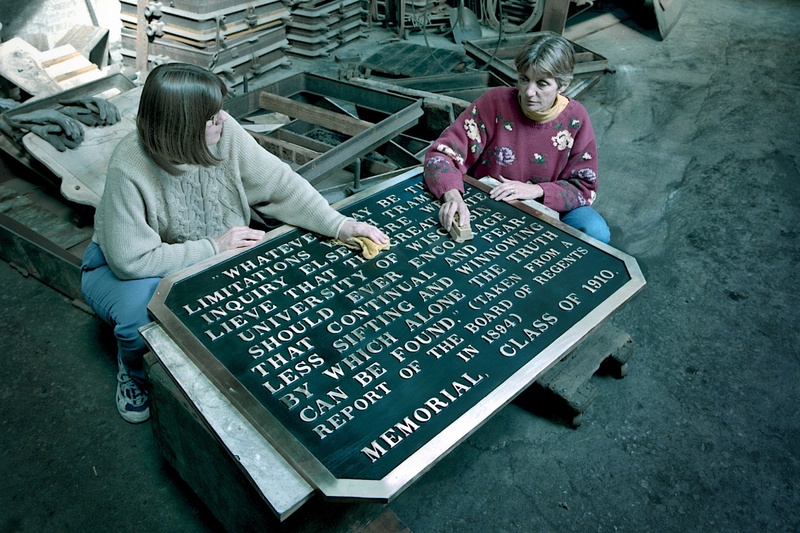 Martha Glowacki and Mary Dickey do finishing work on one of the plaques. Tom Pankratz examines what is believed to be the original wooden “Sifting and Winnowing” plaque form. After a year leading UW-Parkside during its search for a new chancellor, Dr. Gordon H. Lamb was named interim head of the University of Missouri System. 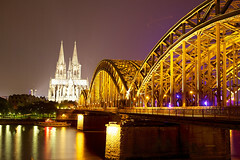 He later founded his own consulting firm in Missouri doing executive recruiting. 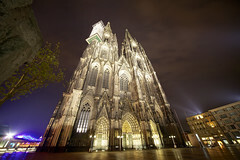 Dr. Lamb was a renowned expert on choral music and the author of Choral Techniques. 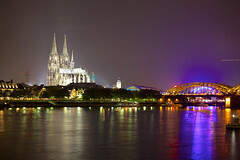 As a music professor and choral conductor, he conducted concerts in 17 states and in Europe. He spent 10 years as president of Northeastern Illinois University, preceded by 16 years as a music professor and administrator at the University of Texas at San Antonio. 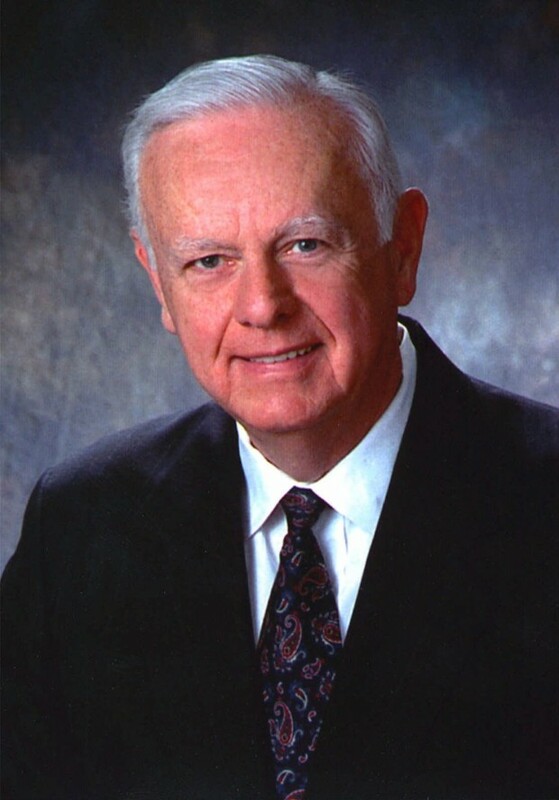 Dr. Lamb was a skilled leader, a true gentleman and a great man — the best boss I’ve ever had. 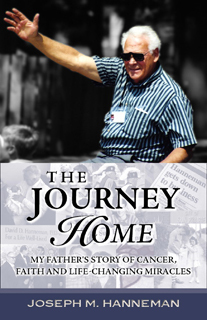 He died on February 6, 2012 in Columbia, Missouri. 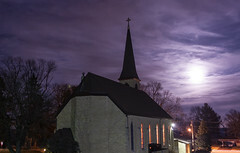 Mary Dickey is curator for River Arts on Water, a gallery in downtown Prairie du Sac, Wisconsin. 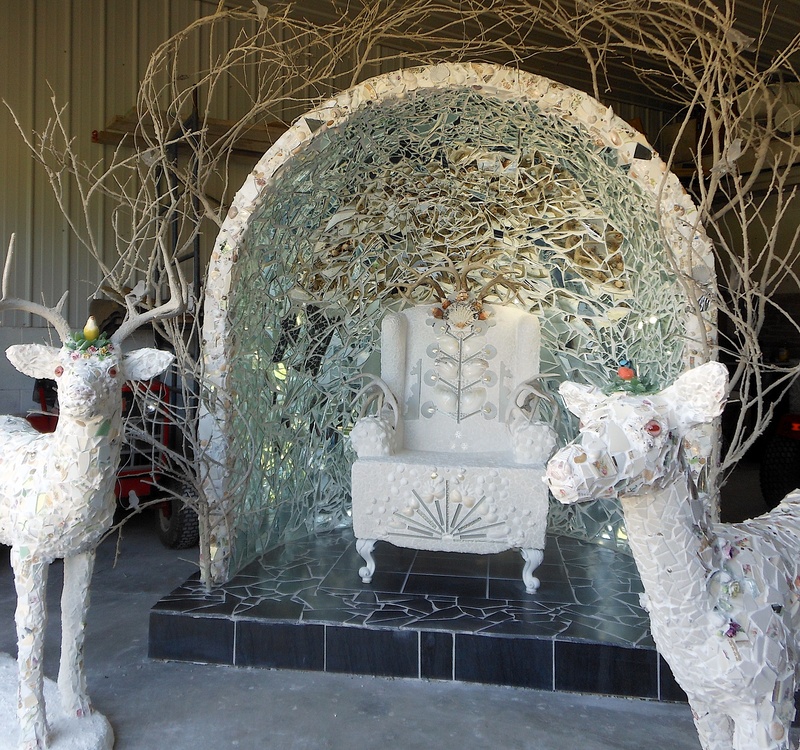 She recently designed and created a roadside shrine, “A Call to Beauty,” part of the Fermentation Fest Farm/Art DTour in fall 2014. Martha Glowacki is recently retired from her role as curator of the James Watrous Gallery in Madison, part of the Wisconsin Academy of Sciences Arts & Letters. She was previously director of the Design Gallery at UW–Madison. She and Tom Pankratz worked together on the 1999-2000 restoration of the World War I Doughboy statue in West Bend, Wisconsin. Pankratz sold his Madison foundry in 2014 and moved out West. 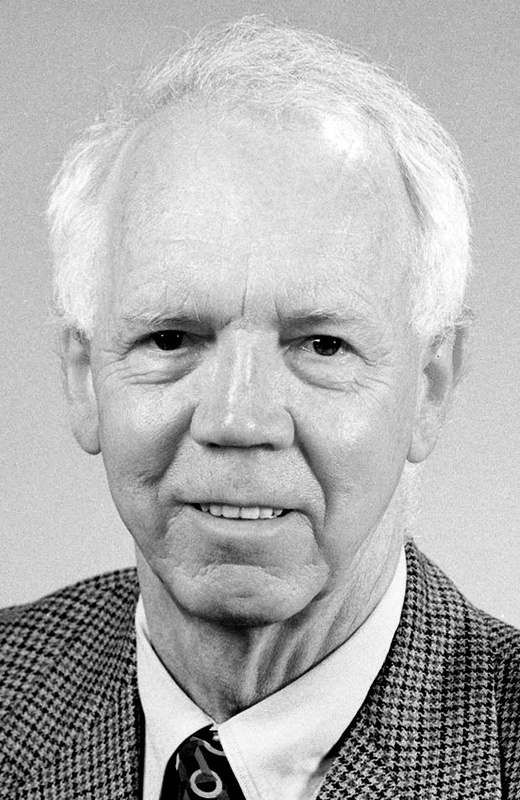 W. Lee Hansen, professor emeritus of economics at UW-Madison, has been conducting research on the UW System’s diversity programs. He is writing a book that will, among other things, examine the costs vs. benefits of diversity programs, arguing the university should have an admissions system based on merit and academic promise. He has also written extensively on the issue of academic freedom.